The tax overhaul plan proposed by President Trump and now being considered in Congress would end the deduction on federal income tax forms for state and local property taxes. Governor Cuomo says it would disproportionately harm New Yorkers, where property taxes are among the highest in the nation, and he’s taken opportunities at public events recently to make the case against the plan. Cuomo calls the plan unfair “double taxation”. If New Yorkers are not allowed to deduct their state and local taxes, they would essentially be taxed twice. Once, by state and local governments and again by the federal government on earnings that they already paid in the form of taxes to the state and local governments. He estimates it would cost New York $17.5 billion dollars a year. Cuomo predicts that getting rid of the deduction would also ruin the state’s business climate, which is already struggling in some regions. 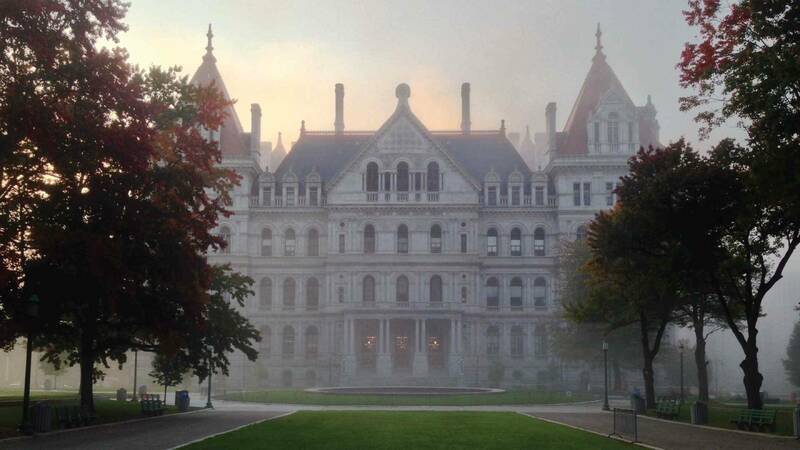 “It is an attempt by the federal government, purposeful or coincidental to make New York and several states actually less competitive for businesses,” Cuomo said on October 3rd in New York City. The governor is not alone in his opposition. Fellow Democrats, including State Comptroller Tom DiNapoli, are also worried. DiNapoli said recently that he’s “he’s very concerned” about the effects of eliminating the deduction. “For a high tax state like New York, state and local tax deductibility has been a very important component of the federal tax code,” said DiNapoli who said even with a proposed higher standard deduction it’s still not a “win” for New York taxpayers. DiNapoli and Cuomo have conducted separate studies showing that New Yorkers give over $40 billion dollars more in taxes to the federal government than the state gets back, an imbalance that has doubled in recent years. US Senator, Chuck Schumer, who is New York’s senior Senator and the Senate Minority Leader, says it’s not just New Yorkers who will be adversely affected. Schumer says one-third of total taxpayers in the US, or around 44 million, currently take the state and local tax deductions. He recently released data showing that people in states like Georgia, a Republican stronghold, and Colorado, would also be affected. Schumer predicts that the elimination of the deduction will eventually be dropped from the plan. He says he was involved in the last successful tax overhaul in the 1980’s. He says the deduction was ultimately kept in the plan because it would have adversely affected too many lawmakers’ constituents. Several Republican congressmen and women in New York have already said they are against getting rid of the state and local property tax deductions, including John Faso of the Hudson Valley and Peter King of Staten Island. Seven GOP members, including Claudia Tenney, and John Katko, both of Central New York and Elise Stefanik of the North Country, wrote a letter to Trump’s Treasury Secretary Steve Mnuchin, asking him to reconsider. Cuomo says if the final plan includes the elimination of the deduction, he’ll go to court to stop it.